Luan Gaines interviewed British author Philippa Gregory about the protagonists of her latest novel, The Other Queen - Mary, Queen of Scots; her longtime companion, Bess of Hardwick; and Bess's husband, George Talbot, Earl of Shrewbury - and how they comprise a microcosm of Tudor society. Interviewer Luan Gaines: What prompted you to write The Other Queen , the compelling story of Mary, Queen of Scots? Philippa Gregory: I read the wonderful biography of Bess of Hardwick by Mary S. Lovell and realised quite how long Mary Queen of Scots was imprisoned in England, and that she lived for most of that time with the fascinating and unconventional Bess of Hardwick. The combination of these two women, and the political unrest that Mary brought with her would be, I thought, a wonderful starting point for a novel. When her cousin does not immediately restore her to the Scottish throne, Mary declares that she will never forgive Elizabeth. “Born Queen of Scots, crowned Queen of France and heir to the crown of England,” does Mary not appreciate the threat she poses to Elizabeth? Does Stuart’s religion mitigate against a successful return to the throne of Scotland? One of the things that I like about my take on Mary Queen of Scots, in which I follow the fine historian John Guy's recent biography, is in recognising Mary as an astute politician. I am sure she knew how dangerous she was to Elizabeth and it was partly that which convinced her that Elizabeth would have to help her return to her throne. Of course the Protestant Scots did not want a Roman Catholic Queen, but they had served successfully under a Roman Catholic regent - Mary's mother, and Elizabeth's own country of England was mixed religion too. Sir William Cecil, Secretary of State, is critical to the longevity of Virgin Queen’s successful rule, often ruthless in his actions. Why is Sir William so disliked by the nobles in the court? As long as he has Elizabeth’s support, can Cecil’s power be checked? My view of the Tudor court, Elizabeth's as well as Henry's, is one of competing power bases. Cecil is regarded by the old nobility as a new upstart whose relationship with the Queen is based on his loyalty to her when she was a disregarded Princess. Their history certainly indicates that he always had her support and he was the most powerful and influential of her councillors. The Other Queen is told from the perspective of three main protagonists: Mary Stuart; George Talbot, the Earl of Shrewsbury; and Talbot’s wife, Bess, Countess of Shrewsbury. How does the lifestyle of each color their narratives? It was very interesting to me to show that Mary's sense of her own royalty coloured everything that she did, and all her demands - however extravagant - were part of the expression of that royalty. Bess was a commoner who came up from a yeoman background and her values were always those of a self-made woman, and George Talbot is from an old and established aristocratic line. They are a microcosm of Tudor society, and their contrasting views and interpretations of their position in society makes a lot of the tension in the book. The Queen is born to her position, Bess has made hers: these are opposing views. Bess, Countess of Shrewsbury, is a woman bred of the Reformation, her houses “chiseled from the dying body of the old church.” Bess prospers in Elizabeth’s England, where “a woman like me, born as low as me, can make and keep my own fortune.” How do Bess and Cecil’s similarities bind them together? Bess and Cecil represent and illustrate the mobility of Tudor England, that someone could rise by their abilities and become wealthy and significant. Bess and Cecil are both building great houses at the period of this novel, to proclaim their rise to greatness, they understand both the distance that they have come and the dangers that face the society that has made their success possible. Although we meet them only occasionally, Queen Elizabeth and William Cecil play significant roles in this unfolding drama. How does Elizabeth’s recalcitrance in resolving Stuart’s restoration affect Mary as the months pass? And how do Cecil’s actions affect Bess and George’s marriage? Elizabeth's reluctance to restore Mary to the throne of Scotland drives Mary to a position where she has to conspire with other Roman Catholic powers, the natural enemies of Protestant Elizabeth. As the months and years go on, Mary starts to see Elizabeth as her enemy and not her ally and plots directly against her. Cecil, as Elizabeth's chief advisor was always committed to weakening the neighbouring kingdom of Scotland, and opposed to Mary's return. Because of this the Shrewsbury’s find they have to host Mary Queen of Scots at enormous personal expense and strain for far longer than was at first planned. Talbot believes Bess’s alignment with Cecil is “worse than infidelity,” yet their wealth is “evidence of doing the right thing, of God’s favor.” Why is this betrayal more painful for Shrewsbury than if Bess actually was unfaithful? To Shrewsbury Bess becomes a spy on her own husband, and joins with a lower-class man against his own group of aristocrats. He finds her disloyalty to his class as painful as a personal betrayal. In his view, it means she is not worthy of her position and therefore she should not have become his wife. Shrewsbury is one of the “old lords,” enamored of the days of Henry’s rule, readily subscribing to the belief that women are inferior to men in all respects. How does his character blind the Earl to the events unfolding around him, the treasonous plots, his wife’s growing disrespect? Who is truly inadequate in the situation, George or Bess? George's belief in the authority of men and the honour of the aristocracy renders him helpless when he faces his wife's plots and the dishonourable behaviour of a Queen. He cannot understand or cope in the world he now sees. During Mary Tudor’s years on the English throne, Elizabeth is moved from castle to castle, avoiding the treasonous plots that swirl around her, claiming innocence when she is accused. Other than their different faiths, is not Mary Stuart in the same predicament as was Elizabeth? If not Mary Stuart, does Elizabeth appreciate this irony? I think both Queens were well aware of the similarities of their position, and Elizabeth was acutely aware of the danger of being a Queen without an heir. She would not name Mary Stuart as her heir, and continued to hold out the promise that she would indeed marry and give England an alternative heir. Mary makes the comparison directly in one of her letters to Elizabeth. The Scots queen seems incapable of resisting plots on her behalf, regardless of the danger to her hosts or the lives lost in the pursuit of her freedom: “She can speak three languages but she can tell the truth in none of them.” Is Mary congenitally incapable of behaving any other way? Has she a conscience? This is to impose later values on a historical figure. From her point of view there is nothing more important than the restoration of a divinely appointed Queen to the throne, and lives lost in this cause are well lost: it is a holy cause. The danger to her hosts is of their own making – from her point of view. Everyone would be safe if the English did what Mary believes they should do: restore her to the throne. At the time of the Northern uprising, Elizabeth has been on the throne for ten years. In retrospect, is this other queen and this uprising the greatest threat to Elizabeth’s reign? The very few historians who have studied the northern uprising say rightly that it is the greatest internal threat to the reign of Elizabeth, but many would also say that the danger posed by the rising of the North is greater even than the Armada. Of course, Tudor historians celebrate the Armada, and not the Northern Uprising because it shows Elizabeth at her finest, against an external enemy and does not reveal a disunited and troubled country. I am so out of temper with the Earl of Shrewsbury by the end of The Other Queen . Nevertheless, Talbot’s dilemma is profound, a moral quandary for which he is ill-prepared: “I am a Talbot. I cannot do anything that is at all dishonorable.” How does this loyalty to his monarch and conflict of emotions jeopardize George’s entire existence as the story progresses? George can barely survive in the new world of shifting loyalties which is the consequence of realpolitik in Tudor England. George has a simple moral compass but finds himself living in a complex world. I doubt the world was ever as simple as George likes to imagine, but his belief in simply loyalties and simple rights and wrongs was how he lived his life until this view of the world became unsustainable. When there is no hope of restoration to the Scottish throne, Queen Elizabeth allows Talbot to become Mary Stuart’s jailer for the length of that queen’s imprisonment. What message is Elizabeth sending to Shrewsbury? I don’t think this is quite what happens. Elizabeth leaves Mary Queen of Scots with Talbot for much of the time of her imprisonment, but in the later years she takes her from him because she doubts his loyalty (and indeed, she may have doubted his sanity) after his separation from Bess and the public accusations of an adulterous affair with the Queen. Under Cecil’s stewardship England festers with spies, warrant less arrests, torture, trials for treason. How is the English judicial system corrupted by Cecil’s aggression on Elizabeth’s behalf? Has history justified his action? The mediaeval justice system was not such an organized and pure body that Cecil corrupted it – but it is true that his spy network was thorough and new. Does history justify an action? Always in the sense that what is done, is done. Was he right to take such extreme measures against the threat of Roman Catholicism? I don’t think so and the destruction of tolerance and what we would now call ‘civil liberties’ was a high price to pay for security. And perhaps as we find in our western society now in a similar state of panic: that emergency measures only frighten people and drive them into opposition. True harmonious society is created by trust. I began my love affair with the novels of Philippa Gregory with The Other Boleyn Girl ; since then I have read most of your novels. In writing The Other Queen , did you find yourself sympathetic to Mary Stuart’s cause? And what of Bess of Hardwick? I did become very sympathetic to Mary Stuart’s cause and to her personally, and my version of Bess of Hardwick is I think, one of the most realistic and charming characters I have ever created. I love her matter-of-fact approach to life and her ambitions. What was most rewarding in writing The Other Queen ? Most difficult? The most rewarding was discovering the history of the Northern rebellion which is almost unknown in English history, and the most difficult was thinking how to tell the story of sixteen long years of imprisonment in a way which was lively. I resolved that by having a sort of epilogue from Bess which tells the end of the story. Are you working on another novel? Can you share anything about it with us? I am working on the royal family before the Tudors – the Plantagenets, and they are a wonderfully dramatic and extreme cast of characters. I always suggest that people write the very best book that they can, disregarding current fashions and marketing. If they write a good book then they have that pleasure and pride and the chance of publication, and if they write a bad book then they have had the experience and practice. But to set out to write a book that you the author thinks is second rate is to insult your own talent. And the other thing I advise is to read good literature all the time! Philippa Gregory is the New York Times bestselling author of several books, including The Other Boleyn Girl and The Boleyn Inheritance. A writer and broadcaster for radio and television, she lives in England. She welcomes visitors and messages at her website, www.philippagregory.com. Luan Gaines is a contributing editor of curledup.com. 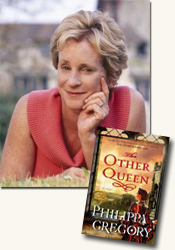 Her interview with Philippa Gregory was written in conjunction with her review of The Other Queen . © Luan Gaines/2008.